Category: MIGHT BE YOUR THING: These practices are not for everyone -- but one of them may be just the thing for you! Any of these might also be, for you, in the "Occasional" category, but are listed here because they are good candidates for being a central practice. In 2011, my partner, Jane, and I undertook a pilgrimage on Spain’s Camino de Santiago, a pilgrimage route since the Middle Ages. Each day brought a new adventure. We traveled alongside olive groves or eucalyptus forests, luxuriating in nature, or beside a crowded highway dangerously close to traffic. We walked for hours every day. Meeting basic needs for food, water, and bathroom breaks required more planning and energy than we were used to. And each afternoon, we stopped at an albergue, a Spanish hostel for pilgrims, and followed our routine: showering, washing clothes, resting feet and treating blisters, having dinner. Yet each place was different. We were strangers, but we had a place, a role: pilgrims – recognized by natives and fellow pilgrims alike. The journey is social, historical, cultural, and physical. What makes it spiritual? For me, it was the centering, what I came to call “Camino mind” -- a state in which I walk tuned into my surroundings and open to what may come, radically aware of unpredictability. We can't plan for each event that may happen. We can only bring our full selves to what happens, rejoice in gratitude for the gifts, and rise to the challenges. There's a saying: you don't do the Camino; the Camino does you. We are made by the way that we go, shaped by the experiences we have. I bring this awareness to the walking I do every day -- and to the way I live my life. For me, the way to the spiritual is through the physical. Time at the gym calms and centered me. The discipline of tai chi taught me how to meditate. And the greatest and most versatile tool of all? A simple walk. 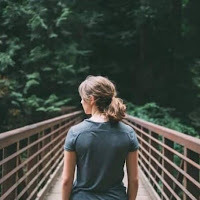 Walking as a spiritual discipline differs from, but can be integrated into, walking for transportation. 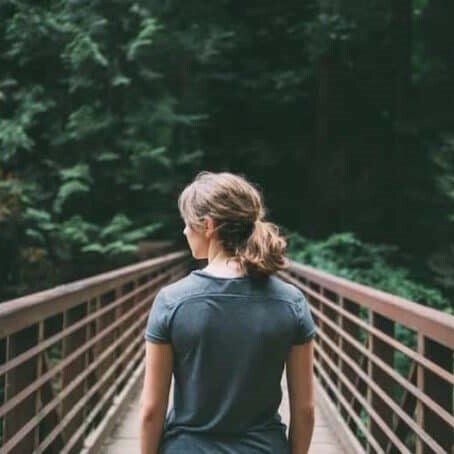 Practitioners as diverse as Buddhist Thich Nhat Hanh and Christian Bruce Epperly have written about the benefits of walking as meditation practice. A walk strengthens the connection with my body and with the world around me. It clears my mind, centers my emotions, and stimulates my imagination. It slows me to a humane pace and restores perspective. Contemporary Westerners spend most days at hyper-speed. Being trapped in such a culture, we forget that our species evolved in a much slower world. Recovering that slow pace opens us to our own beings. Walking returns me to the slower-paced world. Often in daily life, I find my mind flitting here and there. When I slow down and walk, I try to be exactly where I am. It may take me ten or fifteen minutes to begin to slow down and let the sights, sounds, smells, and sensations engulf and capture me. I admire the texture of the bark of a tree, note the different shades of brick on a house, encounter wisps of the sweet smell of honeysuckle, feel the slants of the pavement beneath my feet, wonder at the diversity of angles of roofs in the same block, hear the giggles and shrieks of children as I approach the playground, feel the cool breeze or the hot sun on my skin. With this type of beginner's mind, searching for what is new or different, even the most familiar routes become an adventure. Daily walks engage me with the passing of the seasons and changes in my neighborhood. I see the buds slowly growing, until one amazing morning a flower pops out. I notice the shop that's changed its color scheme and see progress in rebuilding the burned-out townhouse. I feel and hear the crunch of dead brown leaves beneath my feet. I learn my neighborhood, its weather patterns and its people, my neighbors. I discover the native flora and fauna, even in the city. Slowing to a humane speed as I move allows my brain to slow. Thoughts come, as they will, and I notice them, but do not engage with them. I label them as thoughts, and release them, letting them skim the surface layer of my brain like leaves floating on a stream or clouds traversing the sky. I notice where I am and what is right here before and around me. Walking, I bring attention to my body – notice my posture, rate of walking, how my hands and arms move. I attend to what my body may be signaling about what I’m feeling. As I age, I notice the twinges of arthritis. I've learned to modify my movement, maybe stopping to stretch, or massage a wrist that feels tender. What do I need to do to take care of this, the only body I have? Changing the way I walk can adjust my emotions and open me up to deeper levels of awareness. When I notice my shoulders are hunched and relax them, lifting and opening my chest, suddenly I can see the sky instead of the side walk before me. As my body changes, my feelings change. I release the tension, anger, and fear and open myself to joy. I notice the clouds drifting across the blue sky and feel glad to be alive. As my posture changes, I breathe more deeply and find a centered calm as I move. I practice balance as I walk, noticing as the weight shifts from one foot to the other. Where in my foot does the weight fall—heels, toes, in between? How does my body respond when I hit uneven ground? When I'm going uphill or down? How do I adjust my speed? My stance? I learn about my body, how it's related to my thoughts and emotions, and how it responds to the world as I walk. I feel the connection of my skin to the movement of the air. I adjust my pace to meet the terrain. I become part of the world I am walking through. The discipline of attentive walking brings me awareness, connection, and wisdom. How often do you slow down enough to really notice? What activities help you slow down and notice? How does your body show you how you're feeling? How can you be more aware of it? What would it mean for you to think of your next trip as a pilgrimage?